former adviser to India's Defense Research and Development Organisation (working in connection with nuclear weaponry, of all things). Deputy Chairman of the Prashanthi Council who was teaching at the Institute and Director of the Prashanti Digital Studio and Radio Sai Global Harmony. Venkataraman has been deluded - and has further deluded himself - into believing that Sathya Sai Baba created the entire Universe - a physicist who fails to apply the slightest scientific method to his belief. He holds that Sai Baba created the process of evolution itself, but where is his evidence! Clearly there is none whatever and can never be any! He has certainly not studied his Grayling nor neurophilosophy, nor even understood Dawkins' ground-breaking popular book 'The Selfish Gene'. Venkataraman suffers from typical Indian religious spiritualism with its in-built aversion to all genuine self-critical thinking. 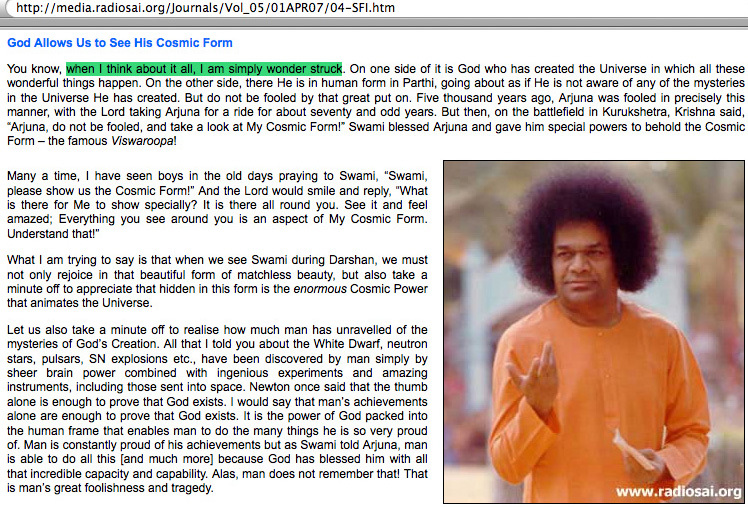 Believing in most Indian mythology as fact, he is wonder-struck by Sathya Sai Baba. He is keen to imprint on his readers that, in studying anything about science, they are observing 'The Glory of God'. This is, of course, an assumption and is not even a testable hypothesis, being a vague (undefined and indefinite) conception which is entirely non-operational. It is wrong to write about science from the viewpoint of a 'true believer' in Sathya Sai Baba as God the Creator Incarnate, as Venkataraman does. Dr. Venkataraman takes after Sathya Sai Baba and all others who try to convince through 'sham reasoning'. Philosopher C.S. Peirce explained this as 'pseudo-inquiry aimed not at finding the truth but at making a case for some conclusion immovably believed in advance'. Trying to foreshorten science to fit onto the Procrustean bed of religious belief, forcing personal and subjective interpretations onto scientific facts and theories - while presenting oneself as 'a scientist' while one is writing mainly as a believer is to disqualify oneself completely as a serious thinker. When the patina of well-known scientific facts is stripped off, only preaching what Sai Baba has claimed remains. Einstein was not a religious believer in God Venkataraman has promoted many famous scientists in his popularistic series on the Internet - as if this thereby lends credence to his main contention: to believe in God. Religionists - especially Sai followers in their endless hagiographies - try their utmost to allege that many scientists are believers, particularly referring to the incomparable Albert Einstein. However, Einstein wrote: "It was of course a lie when you read about my religious convictions, a lie which is being systematically repeated. I do not believe in a personal God and I have never denied this but have expressed it clearly" (see here). The idea of a personal God is quite alien to me and seems even naive." [Albert Einstein in a letter to Beatrice Frohlich, December 17, 1952; Einstein Archive 59-797; from Alice Calaprice, ed., The Expanded Quotable Einstein, Princeton, : Princeton University Press, 2000, p. 217. ] Einstein used the word God occasionally but never in the religious sense or as a Creator [as in 'God does not play dice'- an analogy for causal determinism, in which Einstein did believe]. On the occasion of Mahashivarathri, Bhagawan felicitated five long-standing devotees for their invaluable contribution and dedicated service in Bhagawan's institutions and service projects, and gifted them each with a new car. Dirt poor villagers watched as five of his his fat cat VIP's: Head of Prashanthi ashram, Chackravati, 'propaganda minister' Dr. G. Venkataraman and Co.) were given expensive new Japanese cars out of funds donated for 'good works'! Sathya Sai Baba's younger brother, Janakiramiah, who was a blackmailer of police, a trusted Central Trust member, Janaki Ramiah, was a super-rich speculator on local property died some years ago. 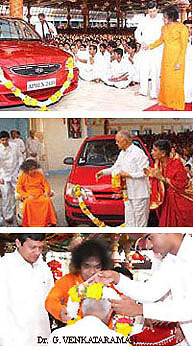 Not exactly a hard-up man by any measure having held top posts in India - Dr. G. Venkataraman gladly accepted a brand new, expensive Japanese car by Sathya Sai Baba out of funds donated to help the poor and needy (NOTE SB claims to own nothing at all! This is what devotees’ donations (including large sums by my wife and I) are evidently used for more and more, i.e. helping rich and influential Indians! Dr. Venkataraman should have been too ashamed to accept it or at least had the moral decency to give it to help the poor instead! Agent in the cover-up of widely testified accusations of criminality: Dr. Venkataraman has also taken upon himself the role as the principal official defender on the Internet of Sai Baba against the world-wide allegations of sexual abuse and being an accomplice to murders and their cover-up. He also endorses fraudulent claims of 'materializations' (many of which were definitively not such), plus many documented lies by Sai Baba, false promises and self-serving (mostly failed) prophesies and predictions and massive, ignorance of much of human knowledge plus unsurpassed, self-aggrandisement. in the interests of damage control, G. Venkataraman downplayed and blatantly denied reports leaking from Sai Baba's ashram by devotees relating to Sai Baba's ill health, which caused him to change the schedule of his public appearances and also having his movements restricted to being driven around in a golf cart. Dr. Venkataraman has also took upon himself the role as the principal official defender on the Internet of Sai Baba against the world-wide allegations of sexual abuse and being an accomplice to murders and their cover-up. Hen claimed that he had never found any student who said he was sexually abused by Sathya Sai Baba. However, seeing he is the top VIP defending Sathya Sai Baba in every possible respect - and seeing that students have been brutally murdered at Prashanthi Nilayam in 1993 at the very least - one would not have expected abused students to confide in this utterly compromised person. Unlike persons who stood forth to defend those abused by Sai Baba (including Barry Pittard and myself who have personal friends who were sexually abused). Venkataraman was also one of Professor Erlendur Haraldsson's chief informants when he re-edited his book 'Modern Miracles' in 2013, and it is easily seen how he was strongly influenced by that excessive 'true believer' and unscrupulous cover-up agent . He also endorses fraudulent claims of 'materializations' (many of which were definitively not such), plus many documented lies by Sai Baba, false promises and self-serving (mostly failed) prophesies and predictions and massive, ignorance of much of human knowledge plus unsurpassed, self-aggrandisement. in the interests of damage control, G. Venkataraman downplayed and blatantly denied reports leaking from Sai Baba's ashram by devotees relating to Sai Baba's ill health, which caused him to change the schedule of his public appearances and also having his movements restricted to being driven around in a golf cart. Not exactly a hard-up man by any measure having held top posts in India - Dr. G. Venkataraman wilfully accepted a brand new, expensive Japanese car by Sathya Sai Baba out of funds donated to help the poor and needy (NOTE SB claims to own nothing at all! This is what devotees' donations (including large sums by my wife and I) are evidently used for more and more, i.e. helping rich and influential Indians! Dr. Venkataraman should have been too ashamed to accept it or at least had the moral decency to give it to help the poor instead! Dr. G. Venkataraman claims he has never found any student who said he was sexually abused by Sathya Sai Baba. However, seeing he is the top VIP defending Sathya Sai Baba in every possible respect - and seeing that students have been brutally murdered at Prashanthi Nilayam in 1993 at the very least – one would not expect abused students to confide in this compromised person. Unlike Barry Pittard and myself, as we have stood forth to defend those abused by Sai Baba, including personal friends, and promised strict confidentiality to all who do not wish publicity and its likely consequences of harassment and worse, especially within India. The amateur philosopher and plagiarist: Venkataraman reviews at length developments in our scientific knowledge of the cosmos... though nothing scientific that is not found in hundreds of books and other media. Venkataraman was a physicist working for the Indian government's nuclear programme. 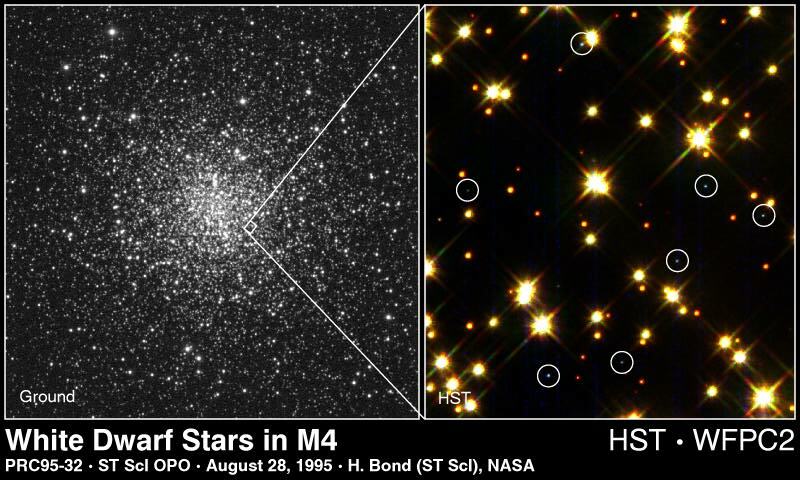 However, he has copied his information on astronomy from other scientific authorities. Yet he does not once attribute anything he reports to its originators or to other scientific sources! He has even plagiarized text from the Dennis Dutton website, without any mention. This failure to cite any references in articles on science or academic subjects is regarded as dilettantism by scientists and scholars. The innocent and uneducated may well believe that Venkataraman discovered such things himself, when he is simply promoting himself as if he were an authoritative researcher. This marks him out as bogus. In addition to this absence of basic scholarly standards, he has a pretentious main agenda. 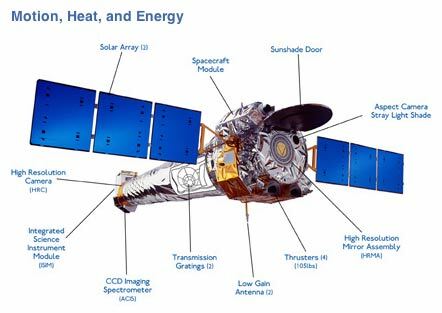 He presumes to inform us of 1) The Cosmic origin of man. 2) Man's Cosmic connections. 3) Man's Cosmic responsibilities, and 4) Man's Cosmic Destiny, no less! These (contra-feminist) titles alone reveal that he is setting himself up as some kind of 'spiritual mouthpiece', misusing science as a mere tool in an attempt to inculcate religious belief - preferably faith in his Lord and Master, Sathya Sai Baba, as the Incarnation of God Almighty in this Age. Dictator Idi Amin - Sai Baba's warm recollections The gullible ex-scientist Dr. G. Venkataraman enthuses over Sai Baba's relations with most gruesome dictator Idi Amin, with crocodiles and more!